Posted by Lacey Hagler on Thursday, October 11th, 2018 at 12:17pm. Regardless of the current weather, the boat should be large enough and built well enough to safely travel over open ocean when the wind and seas aren’t so friendly. You never know when a storm could pass, and it’s ideal to be prepared. The boat must be well built and appropriate for the number of passengers. While some people prefer a cabin, plenty of Floridians cross in center consoles built for offshore fishing regularly. Another important factor is speed. While some residents enjoy the leisurely pace of a sailboat, a whole day can be spent in travel time, so dodging bad weather can be even harder. The powerful Gulf Stream can really drag a displacement hull back, so a center console or a sportfishing yacht that can cruise on plane of at least 25 knots is ideal if you’d like to reach the western islands of the Bahamas within a few hours. Among safety equipment and sound running engines, one of the most important necessities to have is the correct anchor. Although it sounds obvious, adequate anchoring equipment is critical even if you plan to tie up at a marina. You never know when you may break down, and drifting aimlessly is one of the most helpless situations possible. In the Bahamas, some bottoms are hard rock, while others are soft sand. A Fortress anchor holds well in a variety of conditions, but it’s also pretty light. Depending on the size and capacity of your anchor locker, it’s ideal for the rode to be as much chain as possible to add weight to the anchor and hold up against jagged rocks or debris on the bottom. If your boat can’t handle the weight, a combination of chain and nylon is pretty sturdy, but the more chain between the anchor and nylon, the better. Even though most consumer goods in the Bahamas have a 35% duty, if you have any problems with your boat, replacement parts may be imported duty free with a 7% stamp tax as long as the copy of the boat’s cruising permit accompanies the imported items when cleared. If you experience anything contrary to this, call Comptroller of Customs in Nassau at 242-302-3302. To enter the Bahamas, all private vessels must provide a copy of the Bahamas Customs Clearance Form, one Bahamas Immigration card per person (can be picked up at customs), your U.S. Passport, and the vessel title/proof of ownership. All boats with up to three people aboard up to 35’ must pay a fee of $150, and boats over 35’ must pay a fee of $300. Entry fees cover a cruising permit, a fishing permit, and departure tax for up to three people, and the fee is good for a second re-entry within a 90-day period with the same passengers aboard. Each additional person will be charged $20 departure tax. Here’s a tip that has saved us a lot of trouble before- take a picture of your passport and your cruising permit on your phone, and store your permit in a safe dry place on the boat. Leaving it in a hotel room can cause a lot of problems if you’re caught on the water without it, and even though it can’t be substituted with a picture on your phone, officials may be way more understanding if you have something – anything - to show them in case you lose it. Customs opens at 9 am, you must fly the yellow quarantine flag and notify customs of arrival, and you must declare any firearms aboard. The closest port of entry to Palm Beach County is Old Bahama Bay at West End. View other Bahamian Ports of Entry Here. The week or days before departing, keep an eye on the weather reports via NOAA. Departing from the coast, pick up NOAA weather on your VHF weather channels and this should give Gulf Stream-related information. Usually you can pick up these channels in the Bimini Chain, Freeport, or West End areas, where you'll probably be staging your trip back across. There are also different types of subscription weather services offering you custom details about your trip, including Chris Parker's services (www.mwxc.com), and the equipment and services available through OCENS. A little common local knowledge is that summer trips usually bring calmer waters, while winter crossings involve stronger winds and cold fronts. June 1st through November 1st is hurricane season, and since there’s a lot less support in the Bahamas than the states, keep an eye on the weather during that time. If anything looks to be developing in the Atlantic or Gulf, head home before it progresses. If you’re looking for an easy breezy trip look for flat seas, clear skies, and slight southerly winds. Never go on the verge of a cold front or storm. Considering everyone aboard, you should bring enough provisions to last three times the amount of travel time, even if you plan to stop at a marina when you get there. You never know what could happen, and I’d rather be over-prepared than stuck in a bad situation. There is no income tax in the Bahamas, so they make up for it in a usual 35% duty tax on most consumer goods. Fill up on fuel before you head over. You should bank on the possibility that whether or not you find a Wi-Fi spot in the Bahamas, your cell phone will not work. The Bahamian cell phone system is based on GSM, and while you can purchase a cell phone and airtime while you’re there, LTE and GSM service only cover partial areas of the islands. If you’re out on the boat and you can’t live without service, the best chance you’ll have is if you purchase an external antenna mounted as high as possible on the boat and a cell-signal amplifier. VHF radios remain somewhat helpful to communicate with other nearby boats and shore stations, but you’ll find that you’ll be out of range most of the time. A SAT (satellite) phone is an expensive yet effective way to stay in touch if you absolutely insist it. The truth is, people don’t go to the Bahamas to be on their phones; they go to disconnect and relax. When it comes to safety communication, you should have at least two VHF radios- one handheld and powered by replaceable batteries, and one permanently mounted on the boat. You should also invest in or rent an EPIRB. Read more about EPIRBS below under “Special Reminders”. Today, it's easier with GPS chartplotters, but you get in trouble if you rely too heavily on electronics. Sand shoals shift from year to year, and rocky bars and reefs may not be perfectly charted in the first place. A GPS fix is only as good as the chart you're relying on. Order paper charts in advance HERE, and plan out your course by the hour before you leave. Bring an EPIRB and/or Personal Locator Beacon (PLB), and make sure your EPIRB is properly mounted, or it is useless. Register at www.beaconregistration.noaa.gov where you’ve also filed your trip float plan. You can rent an EPIRB at BoatUS.org/epirb. I can’t stress this enough. An EPIRB saved my friend’s life when his engines went out in the middle of the Gulf Stream. He sent an SOS signal and the Coast Guard arrived triangulated his location to arrive in under an hour. Bring a type 1 offshore life jacket for each person aboard; each with a strobe light, a whistle, and ideally a PLB attached. Don’t forget three essential flags for cruising the Bahamas- the U.S. Flag, a yellow quarantine flag for entering port, and a Bahamian courtesy flag. DO NOT FORGET to make sure everyone aboard has their passport before you depart, and you have adequate cash with you. DO NOT DEPEND on credit cards, or your phone for that matter. Taking a pet with you? 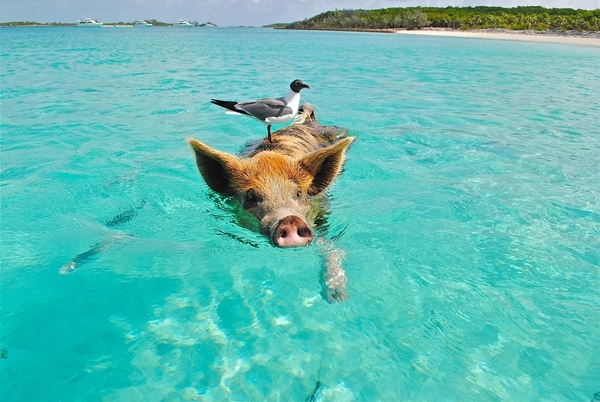 View our guide for taking your furry friend with you to the Bahamas. It is illegal to fish using SCUBA equipment or a speargun.